Throughout Windows’ long and often conflicted history (Windows ME, anyone?) perhaps nothing has been so polarizing and treated with such disdain than the Start screen. So what’s the deal? We all know Vista was a disaster, but then the company released Windows 7, and everything seemed forgiven. However, in the case of Start screen, we’re now already using Windows 8.1, update 1 (technically something of a service pack). Microsoft has clearly made a concerted effort to appeal to desktop users, but the Start screen still continues to get no love. We think it’s simply that Microsoft made the mistake of trying to reinvent the wheel. Only in this case, the wheel was the time-tested Start menu, which though it never quite had a lot of “wow” factor, it did what it did and did it well. A simple click of the mouse and you could easily access your computer’s run function, or the Control Panel, or all your programs. It was all there, it was simple, familiar, and nobody was clamoring for change. With the Start screen, instead of being easy and obvious, people were left scratching their heads and asking where’d all my programs go? How do I print? Where’s the Control Panel and what do I do with all these flashing tiles? This lesson attempts to unwind the mysteries of the Start screen and layout part-by-part, how everything works, and the best ways to get the best experience from using it. Windows 8 is now in its third incarnation following the release of Windows 8.1, update 1 in March 2014 (often referred to as the “Spring Update”). What you see in Windows 8.1, update 1 (we’ll just refer to this as Windows 8.1 from here on) is the culmination of many attempts to backpedal and fix things that were never broken in the first place. For example, in Windows 8, Microsoft decided to remove the Start button. This was not a good idea. Then they forced Windows to boot straight to the Start screen, also unwise. 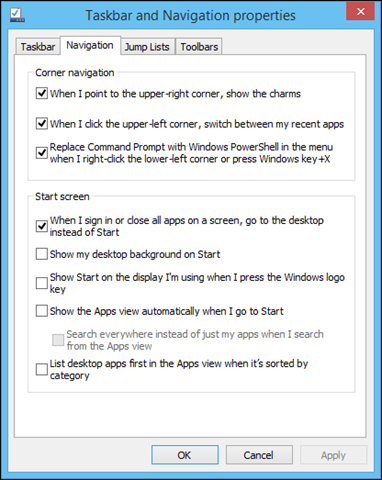 Microsoft attempted to make it up to users by adding a Start shortcut in Windows 8.1 (see below), but all it does is open the Start screen, which still had many of the same annoyances that plagued it in the first place. Luckily, they also caved and let users boot straight to the desktop, so it wasn’t necessary to spend any more time than needed in the Start screen. We’re now on “update 1” and we see even more “regression” to desktop features, specifically the addition of mouse-friendly context menus. 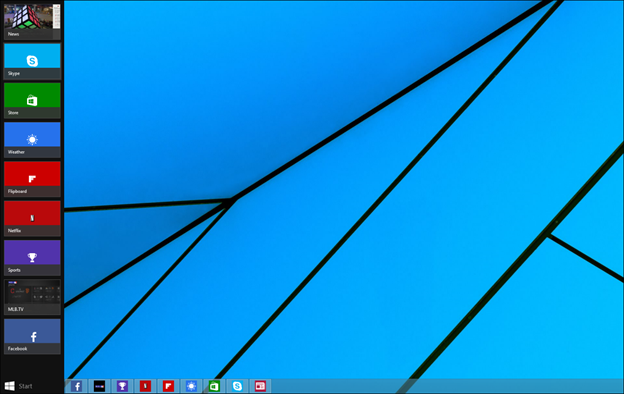 In Windows 8.1, Microsoft added that functionality back via the WIN+X menu. And then, in a further sign of acquiescence, added the functionality to the upper-right corner of the Start screen. So, at this point, the beleaguered company has pretty much re-added almost every feature they moved or removed in Windows 8, and there’s still more to come with the return of the Start menu, apparently slated in August 2014! 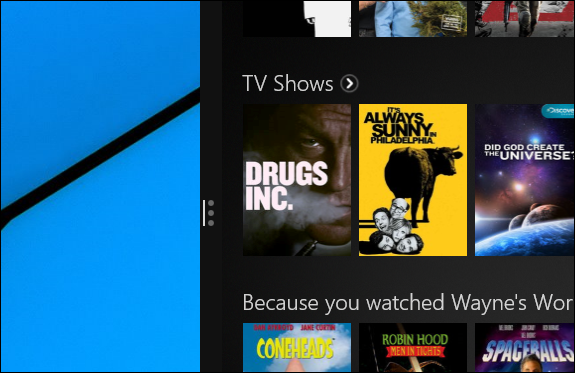 Live Tiles are essentially shortcuts that display what is basically a glorified newsfeed. Shortcuts are a staple to desktop computing and graphical user interfaces. Also known as symbolic links, as the name implies, shortcuts are not applications but rather links that symbolically represent applications. When you click on a link, it tells the computer to open an app located elsewhere in its storage. This way, you don’t have several copies of an application on your hard drive, rather one copy with several shortcuts to it. Live tiles are like vibrant, animated billboards that you can move, resize, and more importantly, disable. Desktop application tiles on the other hand, are just simple shortcuts that have been slightly Metrofied. For the purpose of this series, however, we’re going to simplify things a bit. Since the Start screen is something of a world unto its own, we’ll refer to anything pinned to it as a tile and anything on the desktop or taskbar as a shortcut. That is just about all you immediately need to know about tiles, let’s move on briefly to “apps” since you may be wondering right about now where all your system’s stuff is. Where Did All My Apps Go? On the old Start menu, finding your stuff was easy because there was a big label “All Programs” providing you a direct clue as to their location. Now, not so much. Instead to access all your apps, you can either swipe upward on the Start screen or, if using a mouse, click the small arrow that appears in the bottom-left corner. All your apps are then shown. You’ll see apps, which aren’t grouped into a folder displayed first and then everything else. You can sort everything by “name,” “date installed,” “most used,” and “category” by clicking on the drop-down arrow in the upper-left corner. 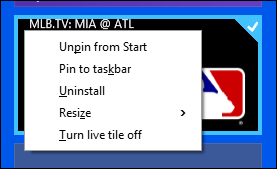 If you touch and hold tiles on the Apps screen, you’re given at least two options: “Pin to Start” and “Pin to taskbar.” For desktop apps, you’re given further options, shown below. Note, with a mouse, you’re given a context menu where you can accomplish the same things. If you want to prune these offerings, you’ll have to work within File Explorer. Unlike previous Start environments, where you could right-click and delete unneeded shortcuts, you will have to navigate to “C:\ProgramData\Microsoft\Windows\Start Menu\Programs\” in File Explorer. You can do this quickly, however, by choosing the “open file location” option from the right-click menu. We’ll discuss the File Explorer in more detail at the end of this series in Lesson 10. We introduced you to charms in the previous lesson. Now we’re going to cover them in greater detail. As mentioned before, the charms are intended to give you access to key device features at your fingertips. That’s really the point of charms, to give you nice, big targets for you to easily hit with your fingers. To access the charms, you must either point your mouse cursor in the top or bottom-right corners, then mouse up or down until the charms bar turns black. If you’re using a touchscreen, you can swipe from the right edge. The charms themselves are four icons plus a Start button, which obviously opens the Start screen (see, it never actually went away in Windows 8, Microsoft just moved it) or if you’re in the Start screen, whisks you back to the desktop. We see all the charms pictured above as they’d appear if they were laid out horizontally; note, the charms will only ever appear along the right screen edge in a vertical strip. You cannot move the charms bar such as you can the taskbar. Note, you can always open the charms using the keyboard combination, WIN+C. Click the Search charm and a search pane will slide out from the right screen edge. You can easily search without accessing the Search charm at all. Either hit the WIN key and start typing your search terms, or hit WIN+Q to search Everywhere, WIN+F to search your Files, WIN+W to search Settings. 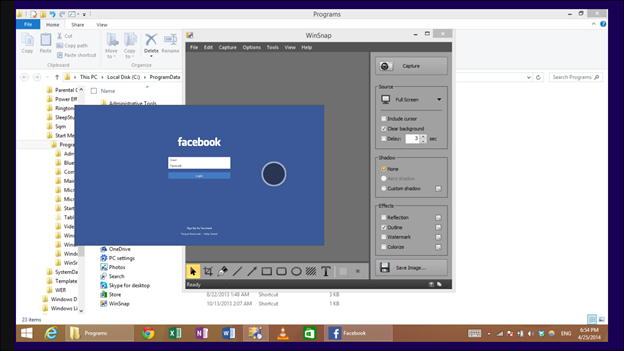 We devote the whole of Lesson 7 to “Mastering Windows 8.1 Search,” but know it works very much the same as it did in Windows 7. How you can share will depend largely upon the app you have installed but let’s say for example you’re browsing the Internet using Internet Explorer and you really want to e-mail your mom this recipe you found. In such a case you could click the Share charm and choose your mail program. How you share will depend largely upon the apps that allow you to share. Further, sharing still does not yet feel fully incorporated, not in the sense other mobile operating systems allow you to share. Finally, sharing from the desktop is limited to screenshots, and you can only share through Windows Store apps. You can quickly open the Share feature by hitting the WIN+H key combination. As you can see the Devices charm give you three options: Play, Print, and Project. So what do these options mean? Well printing is pretty obvious. If you’re using an app, such as Reader and you want to print a PDF, then you’d want to use the Devices charm to do so. Note, the Devices charm can be opened using the keyboard combination WIN+K. There isn’t a dedicated keyboard combo that opens the Start screen’s print feature but you can easily use the direction arrows in conjunction with WIN+K, to choose the “Print” option. Similarly, if you want to project your computer to a second screen, either to duplicate or extend your desktop, the “Project” option is far more simplified than using the traditional desktop control panel method. With this, there is a dedicated keyboard shortcut: WIN+P. Most of this series is settings and options related. Windows 8.1 has many and there’s a lot of new stuff to learn. The “Settings” charm opens a pane with a number of options that will vary depending upon the environment you’re in. In the following screenshot, you see what you’ll encounter if you’re in the Start screen. 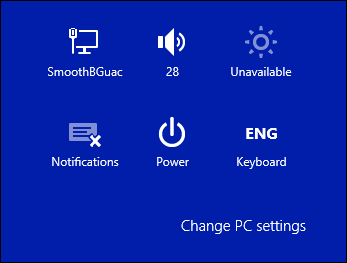 In the next screenshot, we’re shown the options that can be found if you open the Settings charm from the desktop. Note, these “settings” are actually just links to control panels, as in the Control Panel, Personalization, and System control panels, respectively. The Help option shown below can be accessed as always by hitting F1. We’re going to talk a good deal more about all of these settings as we progress through this series, for now, you should simply know that they exist and how to access them. Finally, note every time you open the Settings pane, you’re also shown a group of six controls: Networks, Volume, Brightness, Notifications, Power, and Keyboard. As the screenshot below shows, what you have on your system will affect what options are available, but they will always be there whenever the Settings charm is activated. 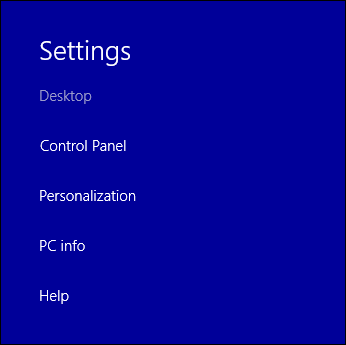 At the bottom of the Settings pane, note the “Change PC settings” link. We’re going to talk a great deal more about PC settings throughout this lesson. Just know for now that this is one quick way to access them. Regardless of whether you’re using the desktop or the Start screen, if you hit the WIN+I keyboard combination, the Settings pane will slide out. Before we end today, we should definitely cover the ways to work with the Start screen. If you’re using a keyboard and mouse, then you’ll be right at home but many of the touch elements will likely be new to you. 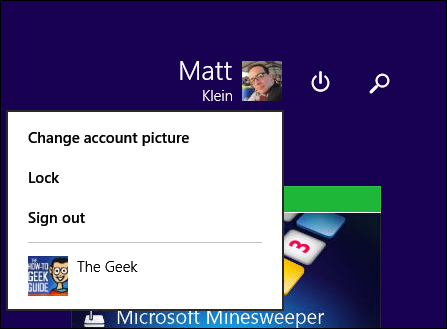 Touch features in Windows 8.1 are your typical crop of swipes and pinches. Let’s briefly review what we’ve already covered and then move on to some other ways to manipulate the Start screen environment. 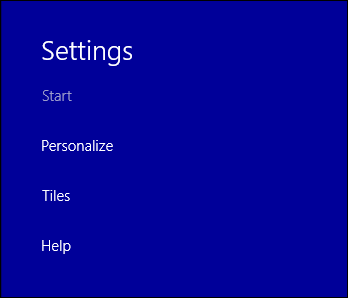 When you’re in the Start screen, you’re most definitely going to deal a lot with tiles. To move tiles using touch, press and hold until a check appears in the upper-right corner. Now that you’re in select mode, you can tap other tiles and move everything as a group. 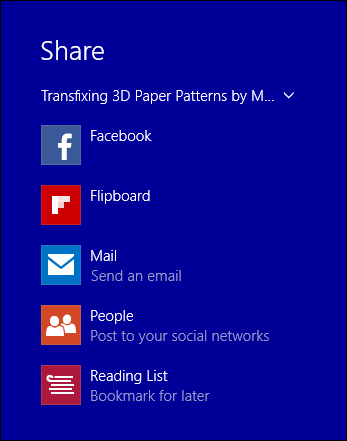 If you drag a tile or tiles to a blank space between groups, you can create a new group. The same goal can be accomplished using a keyboard and mouse. Simply right-click on the tile to select it; if you want to select more than one tile, hold down the CTRL key as you would for any desktop select operation. Remember also, you can either pinch the screen or click the small minus (-) sign in the bottom-right corner, then you can expand the Start screen to a wide view and move entire groups of apps where you want them. Remember, place two fingertips on the screen and zoom out by drawing them apart; zoom in by pinching. If you’ve ever used Android or iPhone, you’ll be well acquainted with this pinch-to-zoom action. 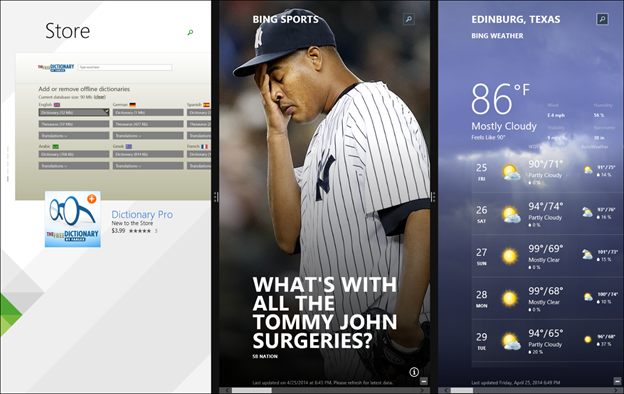 Splitting and inserting apps means that you can have several apps side-by-side. The number of apps you can split depends on your maximum resolution. As we see in the screenshot below, we can easily fit three on our screen. When you first open an app, it defaults to full screen. You can click the upper-left corner to activate the context menu or press and hold either your finger or the mouse pointer on the black title bar and pull downward until the app detaches and shrinks to about one-quarter its size. Simply then drag the app to the left or right to attach it to that edge. Once attached, you can grab the black edge and drag to resize the app to your preference. Note, dragging the app all the way over to the screen edge will effectively minimize it, it will not close. 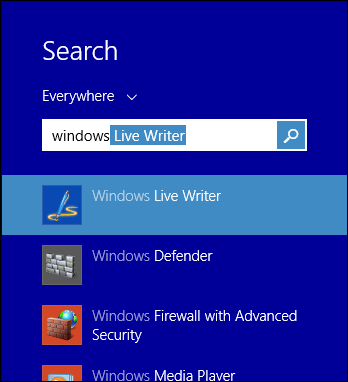 The keyboard combination works as such: with a Windows Store app open, use the keyboard combo WIN+>. This will allow you to step through open apps (Start screen and desktop) until you have the one you want to manipulate. You can then use the arrow keys (while continuing to hold the WIN key) to place things where you want them. You can even WIN+> to choose the slider bar between apps, and then use the right or left arrow to resize an app exactly as you wish. To close an app, you can click the red X in the upper-right corner or pull down with your finger from the top edge until the app detaches, such as you would if your were going to split it. Continue to drag your finger to the bottom of the screen and the app will close. Obviously if you want to minimize an app, you can click the minimize button next to the close button or use app switching as described below. To close an app using the keyboard, simply use the standard ALT+F4 combo. App switching on Windows 8.1, specifically switching between Windows Store apps is accomplished in one of two ways. If you simply want to switch quickly between all your currently running apps, swipe your finger from the left edge and you’ll be able to flip through them that way. Note, this is a touch only feature so there is no mouse/keyboard equivalent. If you want to choose the apps to switch to, you can cycle through them using the keyboard combo WIN+TAB or WIN+SHIFT+TAB. A pane with your running apps will slide out from the left edge. To accomplish this using touch, slide your finger from the left edge until the app appears, much as you would if you were simply switching apps. Instead of flicking the app, continue to hold the app and then drag your finger back to the right edge and the app switcher will appear. Do you still hate the Start screen even with all this handy information we just provided you? 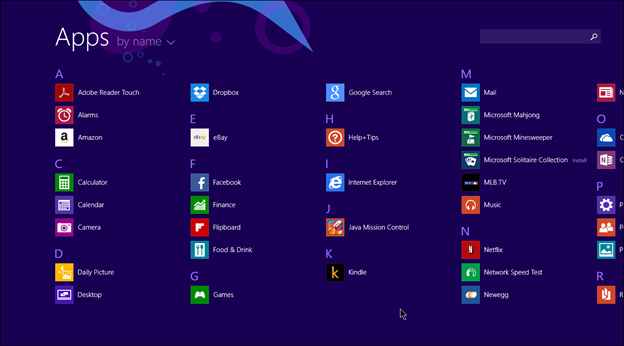 Fear not, in Windows 8.1, Microsoft added functionality to make the Start screen less of a bother. Obviously this was done to appeal to desktop users so the features can be best accessed from there. 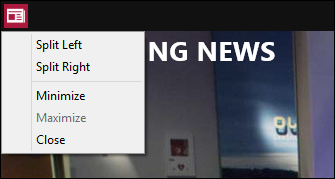 Right-click on the Taskbar and choose “Properties” and then from there, choose the “Navigation” tab. 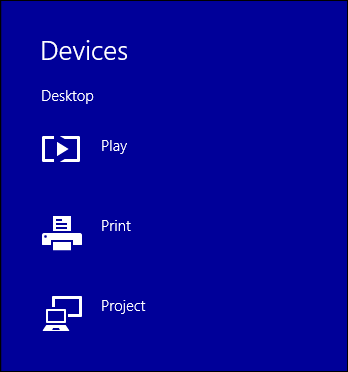 Focusing on the “Start screen” options, note the top option will allow you to automatically boot and login directly to the desktop, show Apps view automatically when you open Start, and so on. As you can see, the Start screen is a big jump from what you’re normally used to with Windows. It is admittedly a lot to get used to. Feel free to refer to this guide anytime you need a refresher but we think once you start using it, the Start screen will quickly become second nature. Your homework for today is to do some tinkering and practice the techniques and keyboard shortcuts we taught you. In our next lesson, we’ll talk about how to easily personalize and make the Start screen your own unique space such as changing your backgrounds, colors, and mastering your tiles.